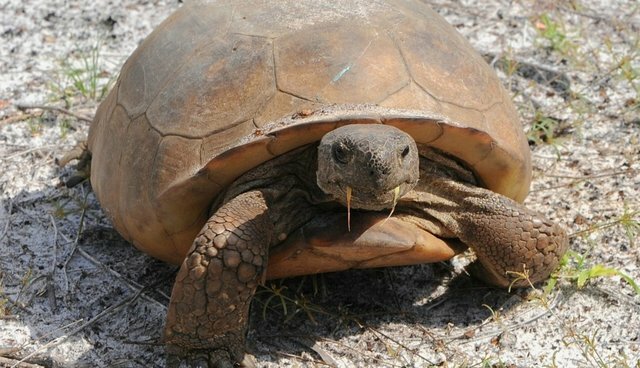 A few of Florida's rare gopher tortoises have taken refuge in a wildlife preserve, thanks to a group of Humane Society volunteers who relocated the reptiles from a construction site. The Humane Society, which has been rescuing the tortoises for nearly a decade, expects to save about 1,000 tortoises this year from new housing developments. The Humane Society volunteers carefully dug up the tortoises, using a flexible camera to locate the burrowed animals and a backhoe to scrape away sand. Finding tortoises "is kind of a slow, painstaking process," says Laura Vedral, a Florida biologist. The rescue program is a bit of good news for the threatened species, Carissa Kent, a founder of the Humane Society gopher tortoise project, tells The Orlando Sentinel. "It's kind of a perfect storm of things going good for a species, for a change," she says.